So apparently I've missed baking... That's the only explanation I have to the baking splurge that has occurred over the last two days. First, it was a Pinterest inspired cinnamon braid that was so delightful I might just give up cinnamon buns altogether. Then, some delicious cakes for a friend. 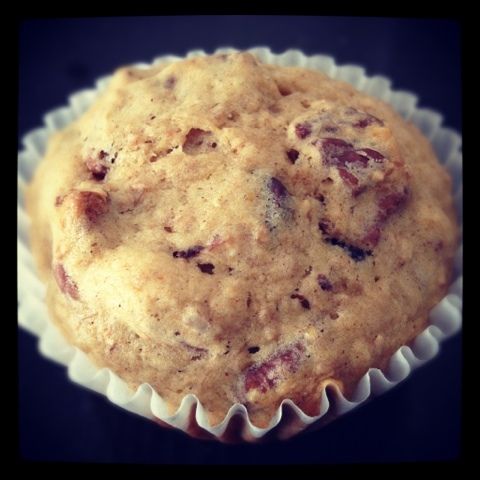 And why not finish it all off with some amazing banana muffins? I have discovered a wonderful new baking blog full of deliciousness just waiting to come to life. And because I can never do anything 'by the book', I took one of her recipes as inspiration and made it my own. 1. 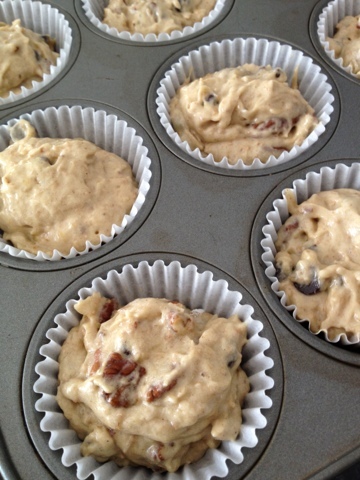 Preheat oven to 350 degrees F. Line muffin tin with papers. 2. In a medium-sized bowl, stir together flour, baking soda, baking powder and salt. 3. In a large bowl, cream butter and sugar with an electric mixer. Add well-beaten eggs and bananas. Beat on medium speed for three minutes. Add lemon juice and bourbon, beat 30 seconds. 4. Add flour mixture and beat until just combined. 5. Fold in chocolate chips and chopped pecans. 6. Using a cookie scoop, fill muffin papers with 2 scoops of batter (or 3 if you like 'em on the bigger side, like me). Bake for approximately 22 minutes or when they spring back slightly to the touch. 7. Cool completely on wire rack. Hi Lei, I don't know how many views you get but I really like your work here and it's obvious that you enjoy what you are doing here. Your writing and the photos are great and it's impressive that you have done all this stuff. The golf cake was awesome and the upcycling was terrific. I get the feeling that "terrific" hasn't seen mass circulation since the 1950s and that using it to describe what you are doing does you a disservice. On the contrary, consider my use of the word here to describe your work in only the best and most classic sense of being inspiring and wonderful. Cheers, Adrian. Thanks Adrian! I'll take terrific any day! I wouldn't necessarily say that baking is very impressive, but I DO love it. It seems that whilst being on maternity leave, I just can't seem to slow down. Baking, crafting, teaching myself to sew, reupholstering furniture, painting... the list is ridiculous.